You are currently browsing the category archive for the ‘BBQ’ category. I used two 12oz. bottles of Kennebunk Pumpkin Ale from Trader Joe’s for this recipe. I then paired ingredients that complimented both pork and pumpkin flavors. In a sauce pot, add the brine seasonings to 12oz of the beer and simmer on medium heat until it is reduced by 50%. Remove from heat and let cool to room temperature. In a large glass or stainless bowl, mix the other 12 oz. of pumpkin beer to the reduction. 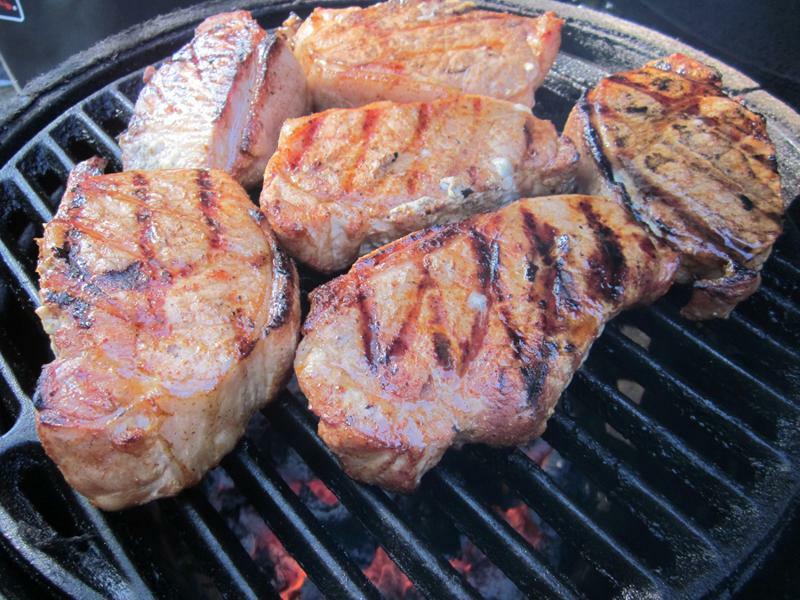 Place pork chops in the liquid, cover and refrigerate for 1-2 hours prior to cooking, turning regularly within the brine. BBQ the chops at 400F until internal temperature reaches 150F. In a small bowl combine the ingredients for the finishing spice. When the chops are done, remove from grill and immediately sprinkle on the finishing spice. Let the chops sit (or “rest”) for approx 10 min before serving. Enjoy with your favorite pumpkin beer…Cheers! Move over Tri-Tip…Brazilian Picanha is here. Picanha has been used for centuries in South American BBQ. The roast is cut from the rump cap of the Top sirloin. It is traditionally served in Rodizo style churrascarias (steak house) where they cook these roasts on a large sword like skewer. Pieces are then cut off of the skewer at the table directly onto a diners plate. This roast has a very distinctive beefy flavor and tenderness indicative of many cuts of sirloin. 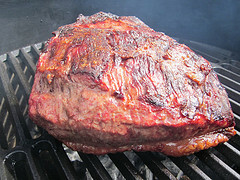 It can be cooked similarly to a Tri-Tip roast over direct or indirect heat. It is best served when there are some grill marks on the meat side and the opposing fat cap has rendered nicely. Consider this option next time you are looking for a great roast to cook for up to 5 people. Each roast weighs approximately 3 lbs. Coat the roast in Olive Oil. Squeeze lime juice on the roast. Let salt melt into meat prior to cooking. Sear meat side first then flip to fat side for duration of the cook. We recently wrote an article for Barbecue Mag Online that featured several Santa Maria BBQ recipes. This dry rub recipe is featured in that article. We find that it brings out much of the natural flavors of meats and vegetables while maintaining simplicity. This recipe can easily be made into a larger batch and stored in your pantry or spice cabinet. * To add more heat, add 1/2 tsp Cayenne Pepper or Red Pepper flakes. Suggestions: When making a dry rub, try to keep the ingredient “grinds” similar. They will be much easier to apply in an even manner. 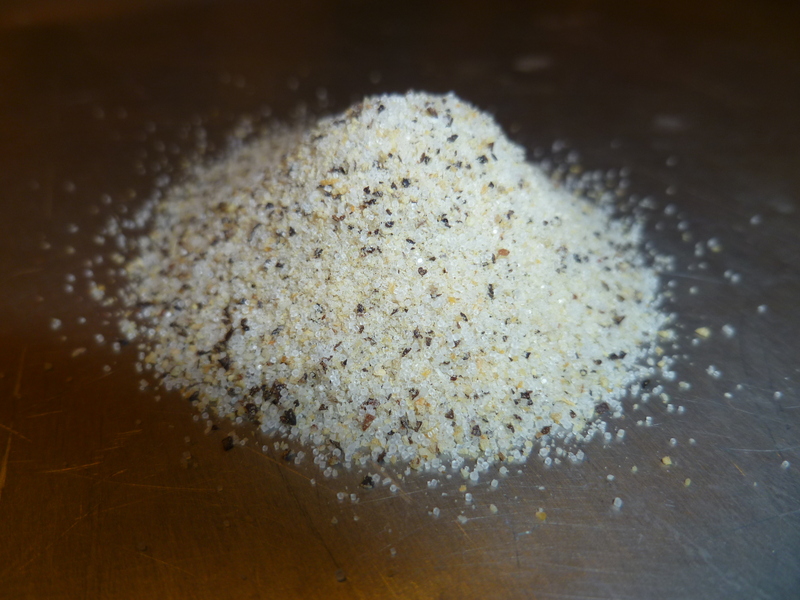 One more suggestion, smaller grind will melt into the meats faster and bond better during the cook. Rub a good olive oil onto the meat surface prior to seasoning, doing this will allow the dry rub to adhere better and dissolve even more quickly. This is a Caribbean style Jerk BBQ Rub – and it’s a good one. I’ve just tried it on chicken and thought I’d pass along what I did. Let the chicken sit for 4 hours then pull it out & dry it off. Season with more The Jerk and wait until it melts into the meat. Remember to use the smallest container possible to brine your meats – less water means more intense results. Grill or BBQ at 275F to 325F until done. I’ll be experimenting more with this BBQ Rub in the future, but for now it will be a top choice for flavor packed chicken. We’re excited to welcome a celebrity guest to Green Leaf BBQ …Tom Porter of Big Butz BBQ fame! SHIGEN! What? You’ve never heard of it? I can’t believe it. For those that have, I can imagine how excited you must be at just hearing the name. For those that haven’t, Shigen are a combination of Shrimp, Chicken, and Bacon. Now two thoughts are probably going through your head; how do you put all that together? And, what is so special about that? Both excellent questions! The first is rather easy to explain but, the second is what is discovered through the experience of creating and consuming them. To make these delicious little beauties you are going to need to acquire some peeled and deveined “16-20” Shrimp. (16-20 refers to the size of the shrimp and in this case means you will get 16-20 per pound.) You will then need to get some chicken meat, it can be breast meat or thigh meat, doesn’t matter but it needs to be cut up into 1 inch cubes. After that there is the bacon! I myself prefer a nice thick cut bacon but you can use whichever you like the best. Also you will want a box of tooth picks, your favorite seasonings and some BBQ Sauce or Cocktail Sauce. That’s all you need to make your Shigen! Now, you are on the way to making some of your very own! But, “what’s next?” you ask. Simple! Now, all that is left to cook them, “but how?” you ask. “Shrimp are one of the most delicate things to cook in the world!” you say. First, take a deep breath! It’s going to be okay. If you have a smoker, that is great, just fire it up to about 250. If you don’t, no problem! Fire up your grill whether it be charcoal or gas. But, if it’s charcoal, have your coals on only one side, and if it’s gas, only have one of the burners going. Now that we have everything warmed up and ready to go. You’re going to place your Shigen on the side without the flame directly under it. For those who have never done this before, it’s what they call in-direct cooking and it is one of the best ways to cook up stuff without charring it to a crisp. Your Shigen will take anywhere from 30-40 minutes to cook. In general you want to see that the shrimp has turned pink and the chicken is white, bacon crispness is going to be to your preference but, I’ve found that when it’s just got a little crisp on the edge is when they are the best. All that is left now is to take them off your grill or smoker, plate them up with some sauce and serve! If you happened to leave the tails on, you can pull the toothpicks out and serve them that way. This is great when you don’t want to find a hundred toothpicks all over your yard the next morning. Now, there are some of you that are seasoned outdoor cooking pros or may just have a lot of cooking experience and are wondering if this can really be for real, after all, shrimp is very delicate, chicken cooks slower than shrimp, and bacon will never be crispy before the shrimp turns into something resembling an eraser. These my friends are all vital concerns and understandable, so, let me try to explain why it all works. We put the seasonings on the chicken instead of the shrimp because if you salt shrimp it dries up even faster than it normally would because of salt causing it to give off water but, because we put it on the chicken, the shrimp gets extra moisture from the chicken, keeping it from drying out. Also, salt has a tendency to work as a heat conductor so the chicken draws in heat faster and cooks faster because of it. 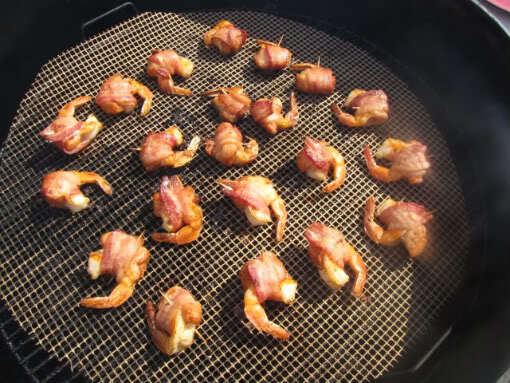 The bacon works as an insulator for the shrimp by giving it a fat barrier from the heat so the bacon is allowed to get a crisp on it while protecting the delicate flavors of the shrimp. Not to mention, everything just tastes better with bacon. And that, my friends is the magic behind how the Shigen works. Get outside fire up that grill or smoker and cook up a mess of Shigen not only will you wow your friends but their taste buds as well! You can find Tom & Big Butz BBQ on most social media outlets like Twitter (@bigbutzbbq) & Facebook. He’s got a great blog at: http://bigbutzbbqsauce.net Big Butz BBQ sauce is also widely available and highly prized by those who try it – find Tom and get some for yourself! Join us for a Spring kick-off Rib Burn…or Rib-a-Palooza as we’re calling it. Backyard style event – laid back primer for the season ahead! Details: www.greenleafbbq.com Click the Rib-a-Palooza. 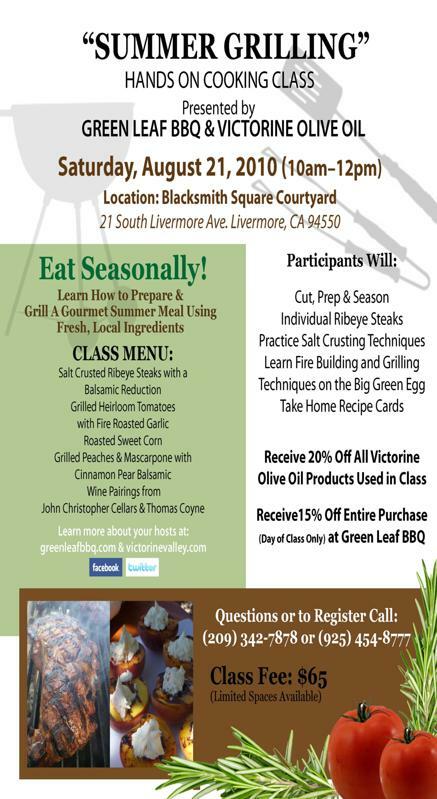 Visit our website at: http://www.greenleafbbq.com for the sign-up details and rules to download. Or visit the CBBQA website at:http://www.cbbqa.com to see the information and current sign-up lists as they are received by the teams.